Bottom Line: This is a nice, shady park with a good variety of play options and bathrooms on site. Due to it's size and the lack of big kid swings, I'd say it's better suited for the younger crowd. 4/5 stars. Worth Noting: No regular swings. Street parking along busy George Mason Dr. and N. Frederick St (must cross field to get to playground). Beyond the playground are some woods which some curious kids may wander into, possibility of poison ivy. For some reason, when I plan an outing to a park, I almost always forget about Lacey Woods. I’m not sure why, as it is a lovely little park with a variety of play options for a variety of ages. It has almost all the ingredients necessary for a fun outing at the park. My kids would like it better if it had big kid swings, but, aside from that, there is plenty to do. 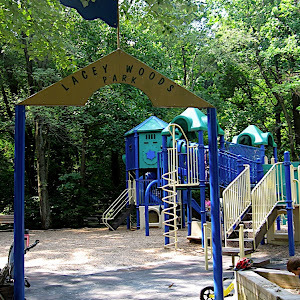 Lacey Woods has one big play structure for older kids, but of course, all ages have fun on it. It’s fairly large and includes a twisty tube slide. 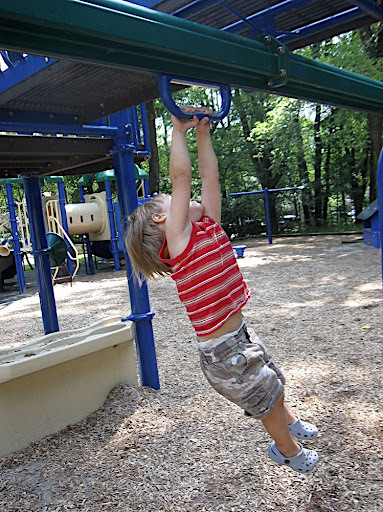 There is also a smaller play structure intended for the younger set. Adam liked hopping on these mushroom stools. There is also a nice little sand area that stays quite shady. It’s nice to have bathrooms and a water fountain on site. There is also a covered pavilion with picnic tables. On the other side of the bathrooms is the basketball court, which several kids enjoyed riding their bikes on. All in all, this is a great little park that stays quite shady, which makes it a great destination on a hot summer day.